It has been requested that this article be rewritten and expanded to include more information (tagged on May 20th, 2018). Message Blocks, also referred to as Hint Blocks, are blocks with faces that appear in various platformers. They are most prevalent in the Yoshi franchise. 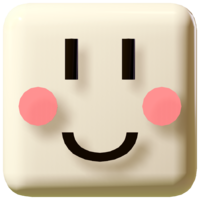 They are usually white, smiling blocks that provide tips and hints to the player. Message Blocks first appeared in Super Mario World, where they usually describe a new level in the beginning stages of the game or explain a new game mechanic, known as Tourist Tips. Unlike later appearances, these Message Blocks have no face in Super Mario World but instead look like speakers. Message Blocks became more common in the Yoshi series starting with Super Mario World 2: Yoshi's Island, where they teach the player controls and give tips rather than saying things outright. Super Mario World 2: Yoshi's Island gives Message Blocks their now-common look of smiling white faces with yellow cheeks. They reappear in the remake Yoshi's Island: Super Mario Advance 3. The Message Blocks return once more in Yoshi's Story. Here they fill the exact same role as they did in Super Mario World 2: Yoshi's Island. Their appearance has changed since then, though, as they are now much bigger, and their mouths continually move. They return in Yoshi's Island DS and are much the same as before but return to their Super Mario World 2: Yoshi's Island form. They return in Yoshi's New Island. They mostly help Yoshi out with how to use the Mega Eggdozer and Metal Eggdozer. They only appear five times in the game, with three in the first level and two in the third. They retain the appearance from Yoshi's Island DS, however their mouths now continually move, like in Yoshi's Story. Their cheeks are pink this time. Message Blocks have a cameo in Super Smash Bros.. They appear in the stage Yoshi's Island where one can be seen in the background along with the Super Happy Tree. The same stage also makes a reappearance as playable for the sequel, Super Smash Bros. Melee, along with Super Smash Bros. Ultimate. In Super Princess Peach, Message Blocks still give hints when hit, although here, they are yellow and blue, referring to Perry. ↑ Super Mario World English instruction booklet, page 22. ↑ Yoshi's Island DS instruction booklet. Page 17. ↑ Williams, Drew. Yoshi's Island DS Nintendo Player's Guide. Page 6. ↑ Super Mario: Yossy Island Japanese instruction booklet, page 16. This page was last edited on April 2, 2019, at 17:15.